DIY: How to Make a Homemade Oven (or Stove Top) Smoking Box for Less Than $25.00, and Smoke Some Mighty Tasty Baby Back Ribs. I can’t afford a stand alone outdoor smoker, and haven’t quite figured out how to use my gas grill to smoke. So for Father’s Day I got a Camerons Stove Top Smoker Box. Nice. 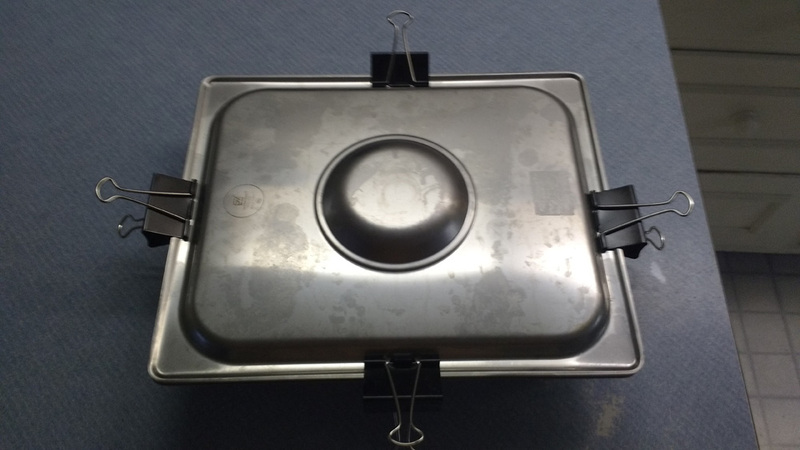 It easy to use, works great, and holds two racks of ribs (overlapping). But $50.00. And then there’s the problem that, if my wife wants ribs, because she has food allergies, they can‘t be smoked together. This made it necessary to have another box. But not spend another 50 bucks. This is what I came up with, and it works just as well as the Cameron’s product. Note: This box will do one rack of ribs efficiently. If you want to do more, buy a full length steam pan and increase depth to 4 inches, with appropriately sized grate and lid. Should cost less than $40.00. But I didn’t price it. 1. 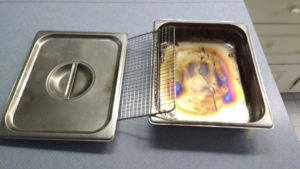 Line the bottom with a square of aluminum foil to fit. 3. Add another layer of aluminum foil to catch drippings, foil should go up the sides. 5. Add your (seasoned) Baby Back Ribs (cut in half to fit). 6. Flip lid over, and add clips to seal. Seal should be tight. 2. 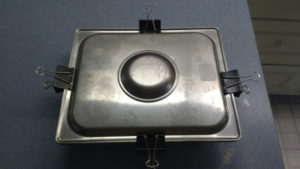 Place smoker box on large burner, heat on medium high for 10 – 15 minutes to start the smoking process. 3. Transfer to oven to complete the cooking and smoking process. 5. Transfer to your grill (preheated and then set to low or 300 degrees), add your favorite sauce (or not), and grill for 15 minutes. Note: Your house WILL smell like a smokehouse for at least 24 to 36 hours, probably longer in the winter time.